← I Read Banned Books! I never obsess over anything. Oh, um, I should probably rephrase that. My friends are rolling their eyes. OCD is something that I slightly suffer from. Some days it really causes havoc in my life. But this isn’t a post about my neurosis in making sure that when locking a door I check it three times. No, this is a post about an obsessions of things. A minimalistic life is one that appeals to me. I can happily live the remainder of my life with what I have at this very moment in my apartment. I don’t have a lot and I don’t need a lot. So imagine my surprise that during my recent move, I uncovered something absolutely horrific about myself. A few weeks ago, I moved into a new place. All boxes were packed by yours truly and about 85% of everything was carried with my very own hands (I am only so proud to state this because I spent the following week in utter pain). The first things to transition was kitchen stuff, then clothes, then cycling gear, and then random stuff from the basement. At this point everything was gone but the furniture and 14 boxes. When I packed these specific boxes, I did not think there was really that many of them. It was just 14 boxes. And they only contained my most prized possessions, so this amount was not bad. However, when I went to lift the lightest box, and nearly snapped my back, it was then I realized I had a sickness–a secret obsession. I am fatefully addicted to books. No! Cursed to be fatefully addicted to books. They draw me in with their eye catching covers, earthy paper smell, and delicately inked pages. When I see a book, it whispers “pick me up… take me home”. There has never been a time when I’ve walked into a bookstore and walked out empty handed. It is a rare trip when only one book is purchased. What a sickness. A heavy sickness (but I can’t give it up–I won’t give it up). So to move these boxes, I had to break the 14 big boxes down into 20 smaller boxes, which I could still move on my own (but they were still dreadfully heavy). I went through hell for my books and I would gladly do it again. I know I will do it again because I am a habitual mover. The only bad thing is that with each move, my obsession only hurts me more. The next move will be worse because there will be even more papery tomes to schlep to a new abode. And before a single one of you asks–no, I will not switch fully to digital. Even if I move halfway across the world, my precious books will be at my side. There is something magical about cracking open the cover and smelling the pages. Inhaling the literature with your nose as well as your eyes. It’s addicting. Don’t lend me a book. If I like it, you won’t get it back. If I hate it, I will probably still keep it and pawn it for a new book that I like. Don’t ever touch my books. Ever. Never Ever. I will break your hands and steal your fingernails. I have actually thrown away clothes on a trip to fit several newly purchased books into my carryon luggage. I have 4 boxes of books left to unpack and need to buy another bookshelf. Pictures of ‘Shrine 3’ are forthcoming. This entry was tagged Book Obsession, Literature Obsession. Bookmark the permalink. If you replaced “I” in this article with my name, it’d still be the truth. There are more books in my house than plates, cups or anything else. If I have a visitor, I worry more that he/she will mess up my books than I do about any other thing. So I moved my bookshelf to the bedroom. I buy books on impulse. They beckon at me. My friend Julian knows, so that when we are in a hurry to go somewhere, he has to make sure we do not pass near any books stores. It is that bad with me. I lost book on April 30th when we attended a meeting in Mombasa. It remained in the restaurant and I didn’t get it when I went back. I felt like I’d lost a person. The rest of the meeting was unbearable. We are too much alike. 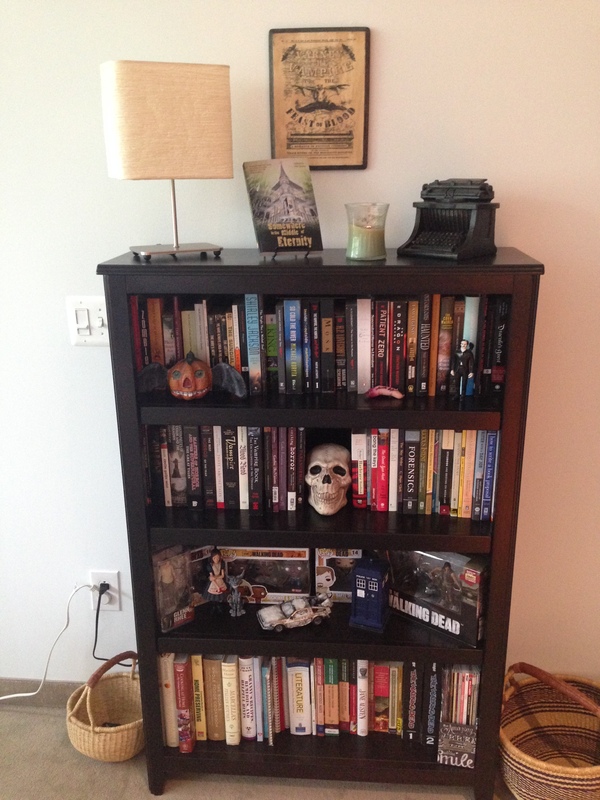 Books outnumber any other item in my home as well. And what you say is completely true–losing a book is like losing a person. I have carried my college text books, the ones I didn’t have to sell, through a dozen moves, including two that were coast to coast adventures. I will not give them up, nor will I lend one to you. I have not done a coast-to-coast move… *sigh* someday I will be a NorCal girl. Though, I dread relocating my growing collection. Amanda hang in there you are the strongest woman I’ve ever known. This is by far not the darkest hour you’ve seen or will see. Your well being will always be in my thoughts. I am glad I don’t have kids… I can only imagine how many more books I would be buying! I have books I bought in elementary school more than 45 years ago, sets of children’s literature and history books I used to read as a young boy, and dozens and dozens I’ve acquired since. We have about 8 shelves the size of Shrine 2, all full. They add up to 20-something moving-book boxes, which moved something like a half dozen times at least in the last 10 years. I avoid bookstores these days because I have no more room for them in the house and if I go into a bookstore I find it very difficult not to buy them. And when my children are grown and gone, I already have plans for the wallspace. Well, since you are planning on obtaining your children’s wallspace once they are gone, that is a good reason to continue buying books now! That way you are prepared the moment they leave. I love it! I can thing of many worse things to be obsessed with besides books 😉 And, I am not rationalizing it because I feel the same way about them – well, okay, maybe just a little bit. I will never go digital. Like you, I like feeling the weight of a book in my hands. I like being able to sense by how many pages are under my right thumb how long it will be before I reach the conclusion of a novel. I strangely enjoy the smell from fanning pages of new books, old books, and anything in between. 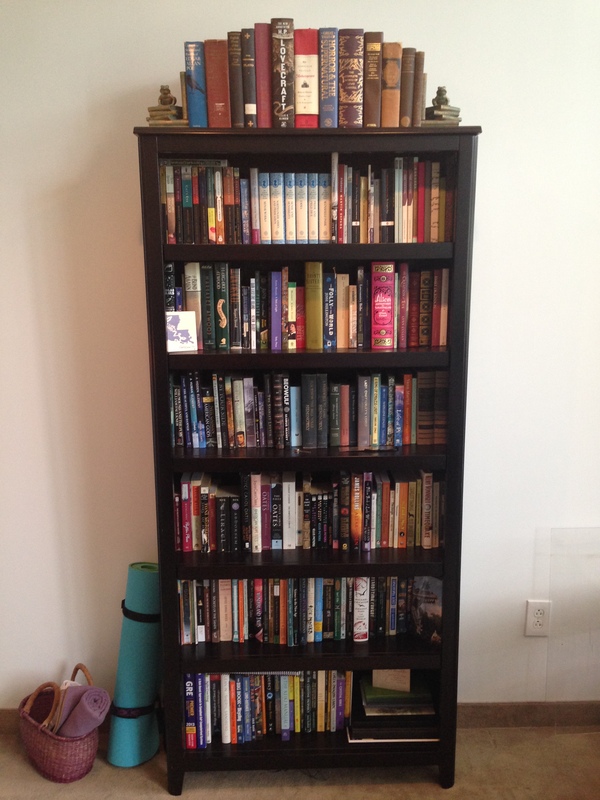 We have these individual bookshelves that we purchased from IKEA and they have slowly filled up over the years. We need to keep adding on another unit to keep up with our stash. We can do that, but we are unfortunately running out of wall space to put those shelves against! Perhaps we should just put them in the middle of the room? Nice! Another lost soul addicted to sniffing the pages. I have my eye on the Hemnes bookshelves at Ikea for whenever I find my “final destination”. I want a library built out of them. Placing the shelves in the middle of the room would be an intriguing design aspect. Make a labyrinth out of them and add an old school card catalogue! Hope you were able to keep to one book this weekend. What did you end up picking up? and YES! I am all ready for Jurassic World. Purchased my advanced tickets about two weeks ago 😉 Are you going to see it?